Download "Guidance. This guidance has been updated to take into account the NICE clinical guideline 167(1)." 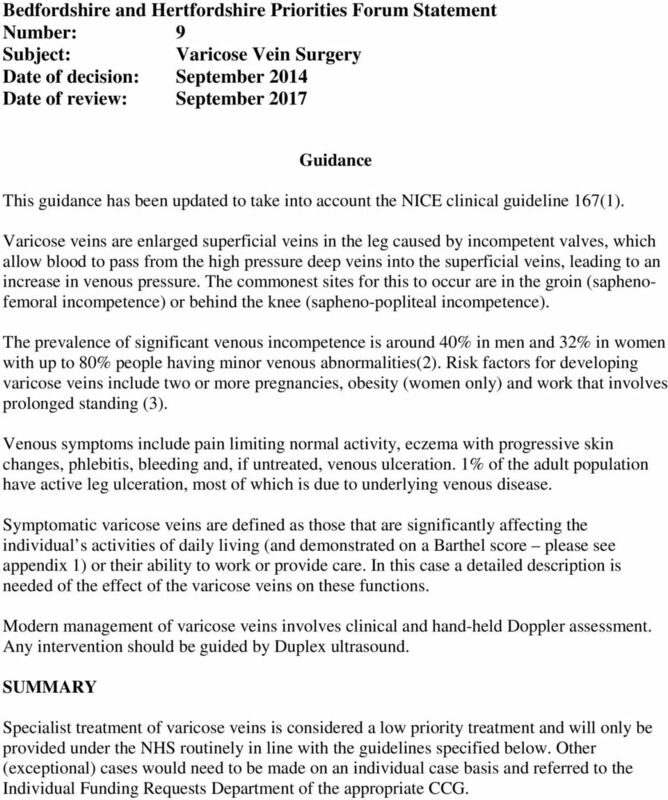 1 Bedfordshire and Hertfordshire Priorities Forum Statement Number: 9 Subject: Varicose Vein Surgery Date of decision: September 2014 Date of review: September 2017 Guidance This guidance has been updated to take into account the NICE clinical guideline 167(1). Varicose veins are enlarged superficial veins in the leg caused by incompetent valves, which allow blood to pass from the high pressure deep veins into the superficial veins, leading to an increase in venous pressure. The commonest sites for this to occur are in the groin (saphenofemoral incompetence) or behind the knee (sapheno-popliteal incompetence). 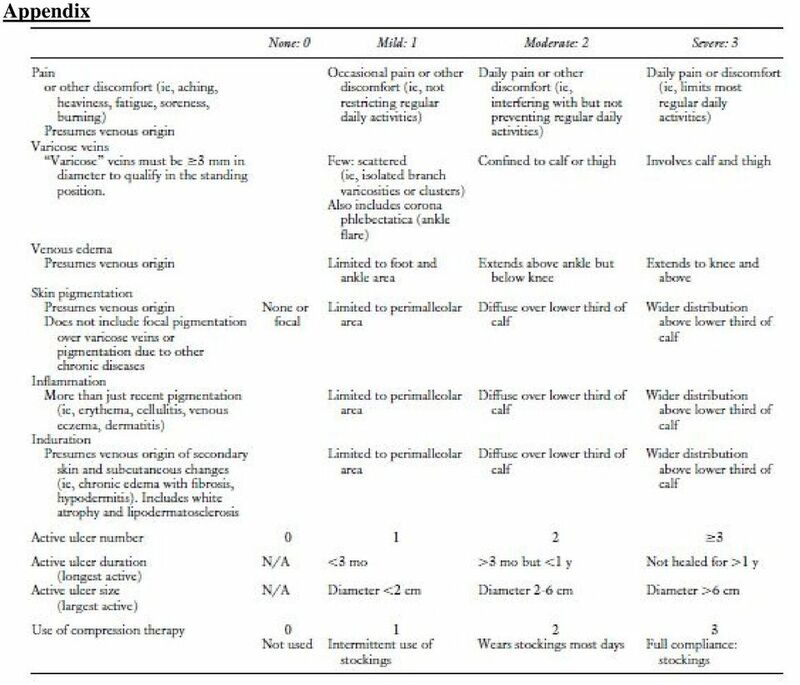 The prevalence of significant venous incompetence is around 40% in men and 32% in women with up to 80% people having minor venous abnormalities(2). Risk factors for developing varicose veins include two or more pregnancies, obesity (women only) and work that involves prolonged standing (3). Venous symptoms include pain limiting normal activity, eczema with progressive skin changes, phlebitis, bleeding and, if untreated, venous ulceration. 1% of the adult population have active leg ulceration, most of which is due to underlying venous disease. 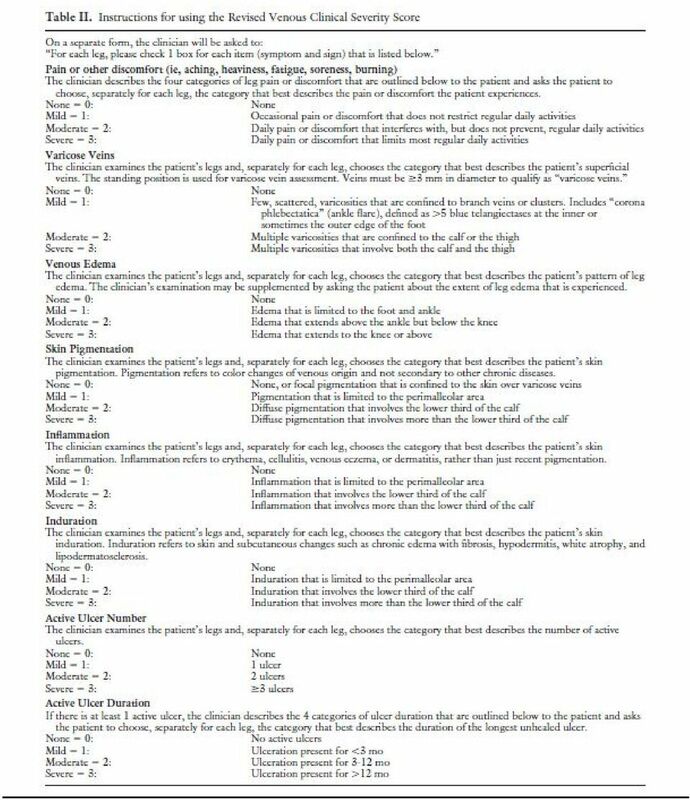 Symptomatic varicose veins are defined as those that are significantly affecting the individual s activities of daily living (and demonstrated on a Barthel score please see appendix 1) or their ability to work or provide care. 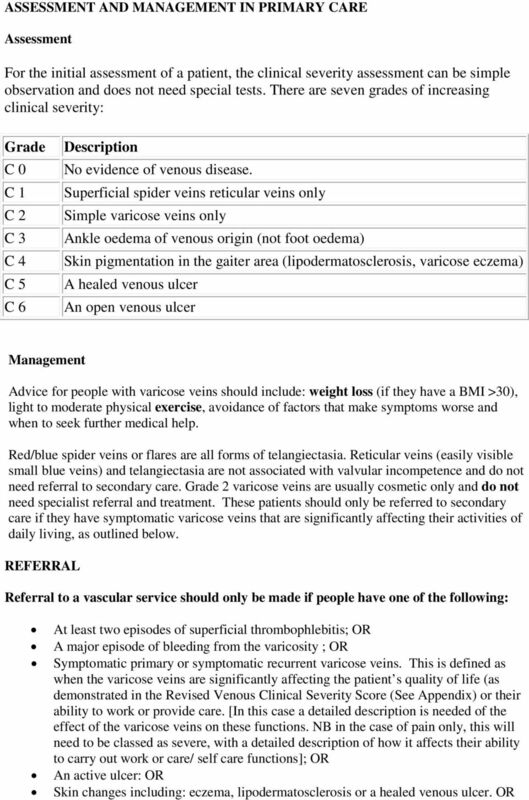 In this case a detailed description is needed of the effect of the varicose veins on these functions. 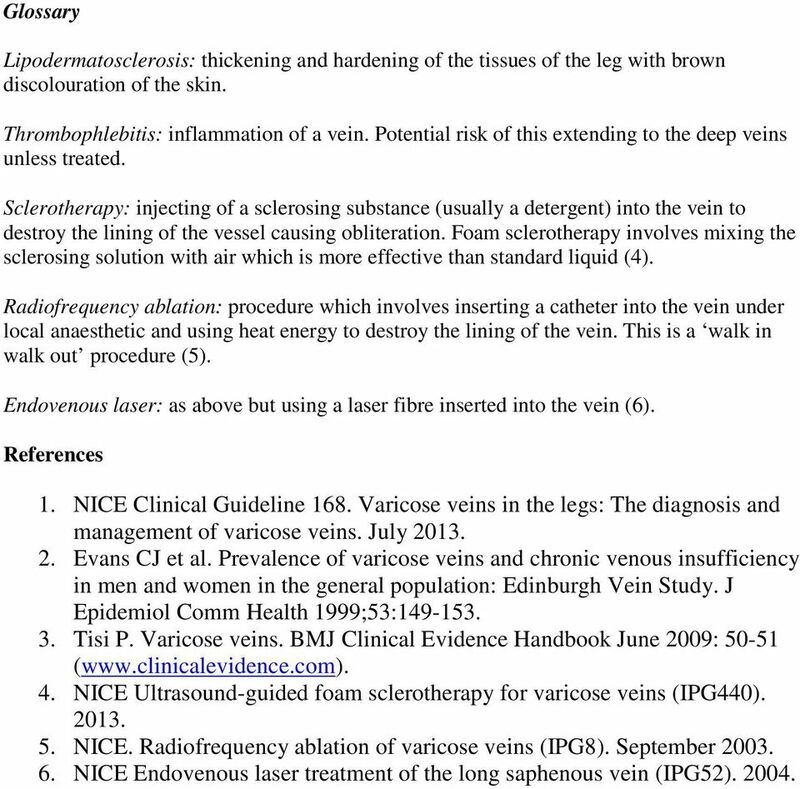 Modern management of varicose veins involves clinical and hand-held Doppler assessment. Any intervention should be guided by Duplex ultrasound. 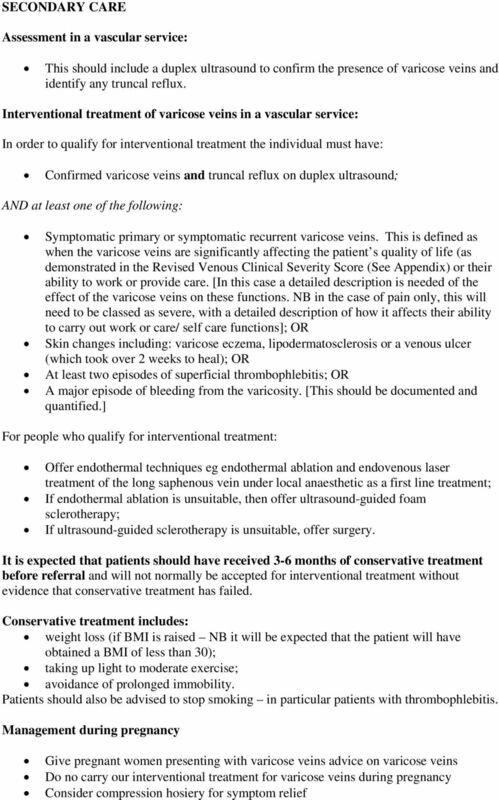 SUMMARY Specialist treatment of varicose veins is considered a low priority treatment and will only be provided under the NHS routinely in line with the guidelines specified below. Other (exceptional) cases would need to be made on an individual case basis and referred to the Individual Funding Requests Department of the appropriate CCG. Grade Complications Action by GP Referral? This information is intended as a general guide only. Please ask if you have any questions relating to this information. ENDOVENOUS LASER ABLATION (EVLA) ANGEL RADIAL EMISSION FIBER NEW STANDARD IN LASER SURGERY Varicose Veins: Beyond Cosmetics A Clinical Issue For many people, varicose veins are simply a cosmetic issue. Veins. Zapping Varicose. Venous diseases affect many people and represent a major cost to the health-care system. Invited papers. CEAP classification and implications for investigations. B. Eklöf Helsingborg, Sweden.